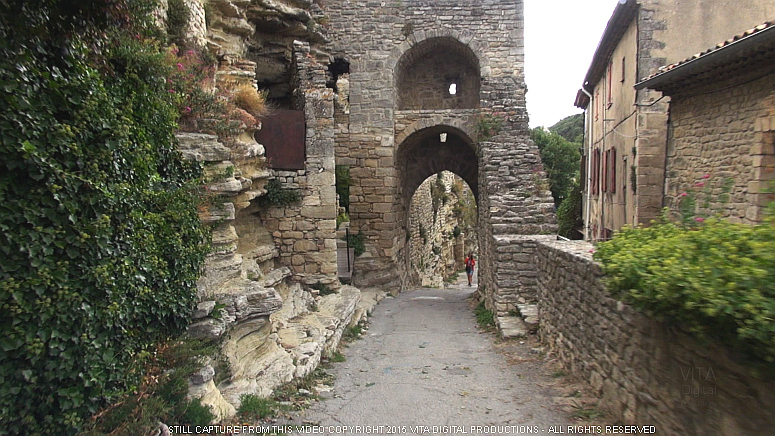 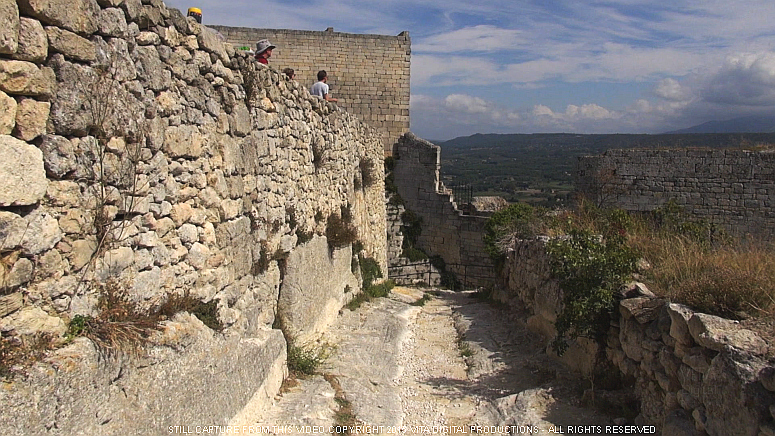 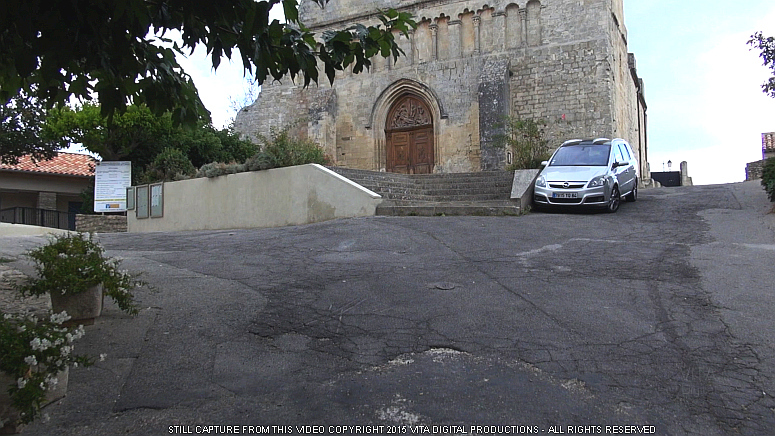 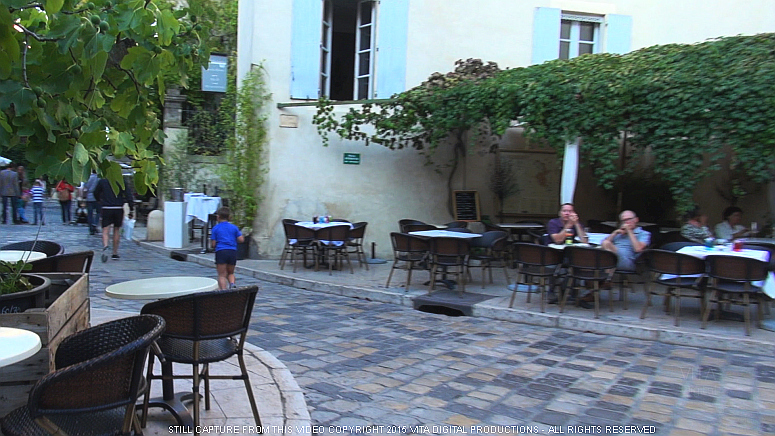 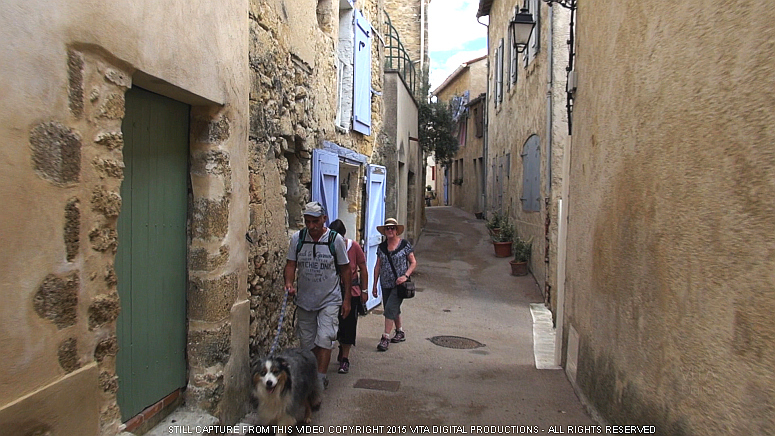 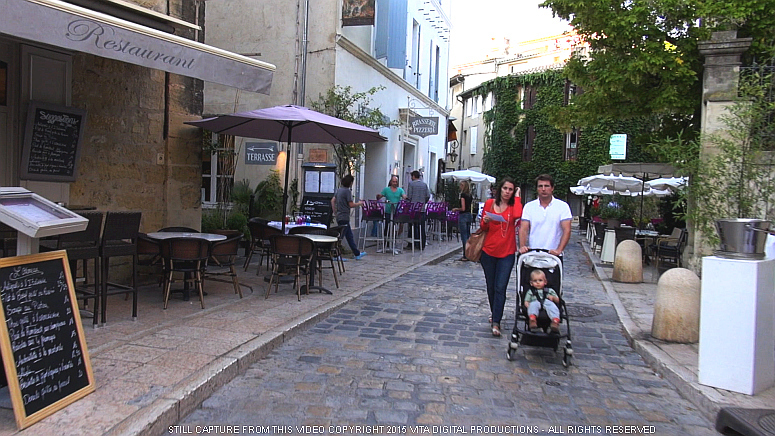 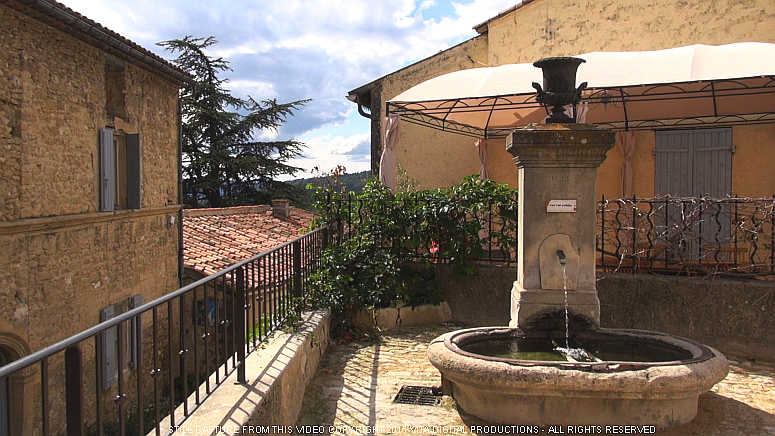 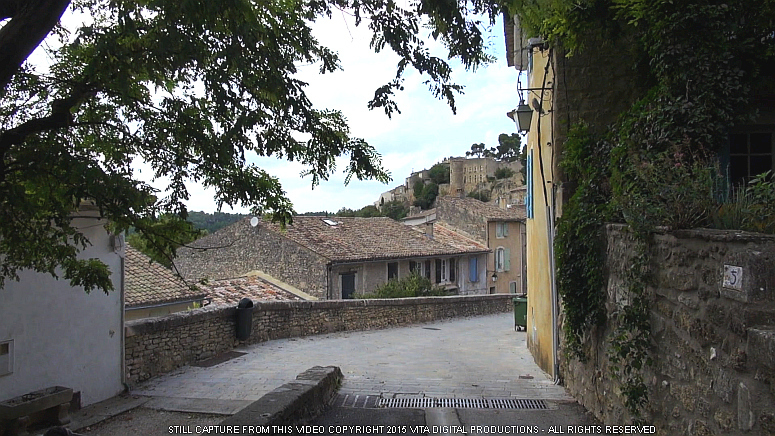 a 60 minute widescreen virtual walk through six picturesque villages in southeastern France. 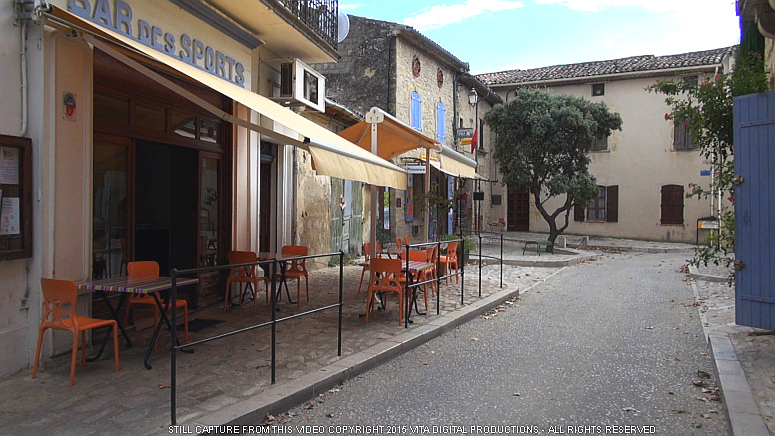 Saignon, Lacoste, Ansouis, and Menerbes, six of the quaint villages that make up Provence. 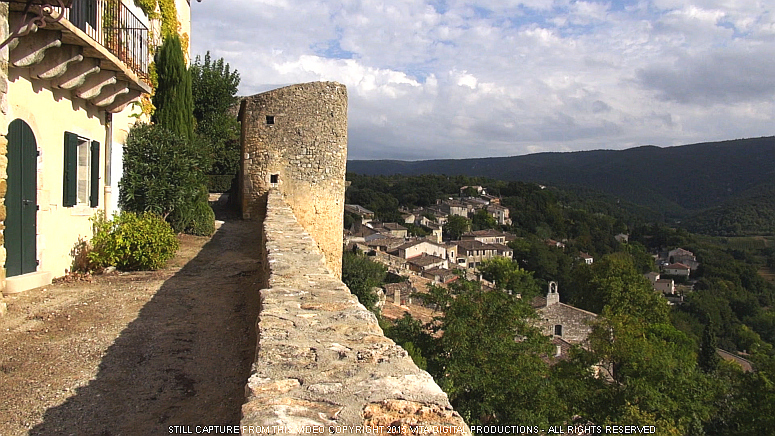 dry summers, mild winters, and abundant sunshine. 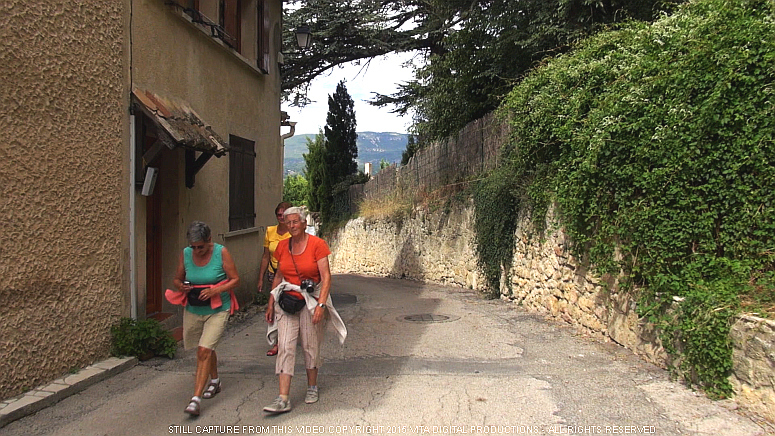 of six French Villages far from the hoards of European tourists. 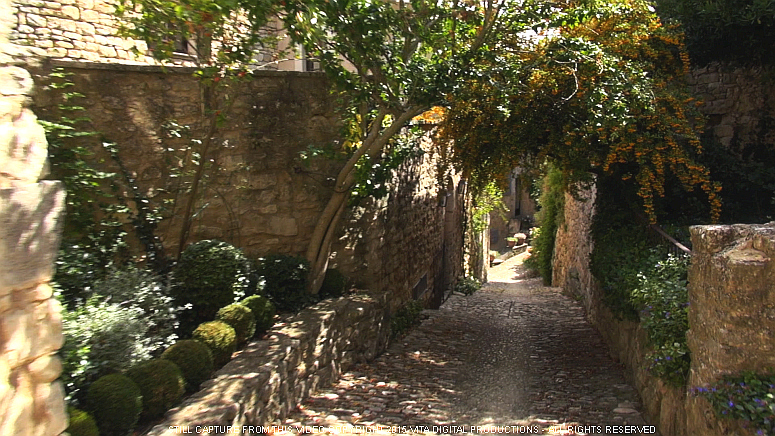 every minute of your one-hour virtual walk through these six picturesque French villages. 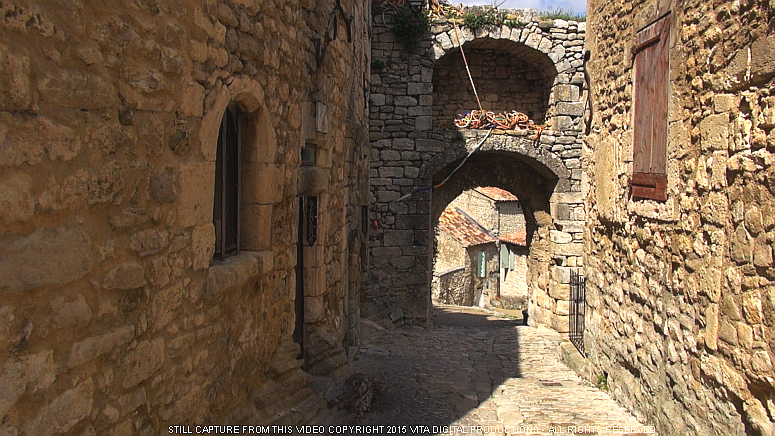 through the streets and narrow alleyways of these six timeless villages. 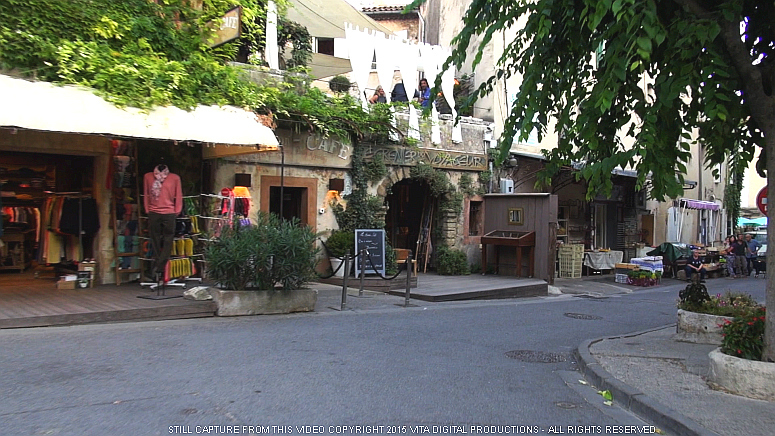 just as they were recorded in Dolby Stereo in Provence. 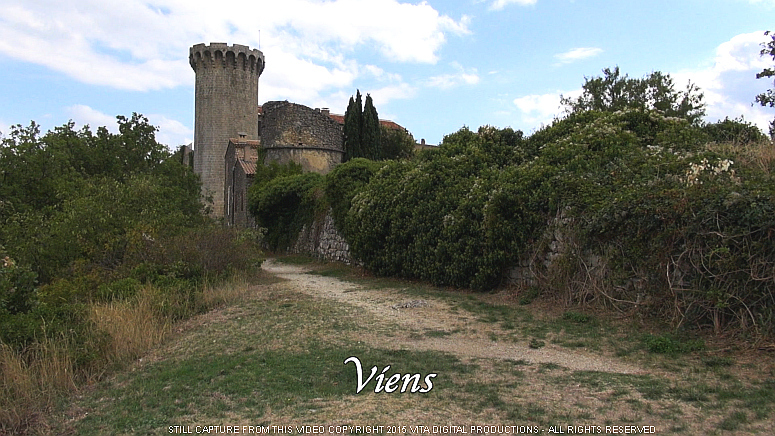 Your 60 minute Provence Villages Virtual Walk begins overlooking a valley outside the hilltop village of Viens. 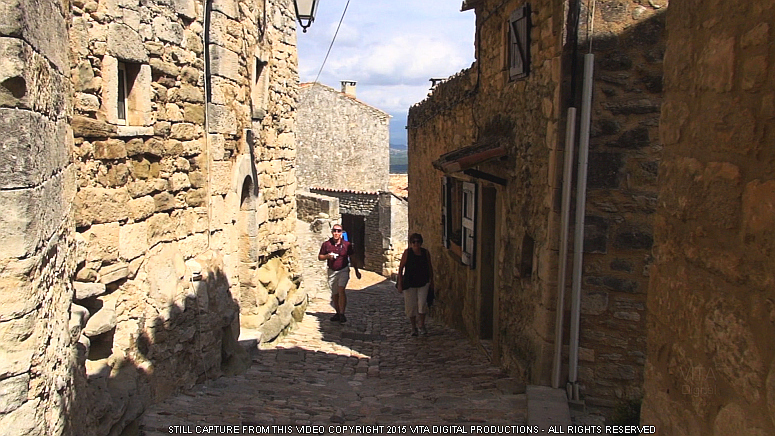 You turn and approach the village proper. 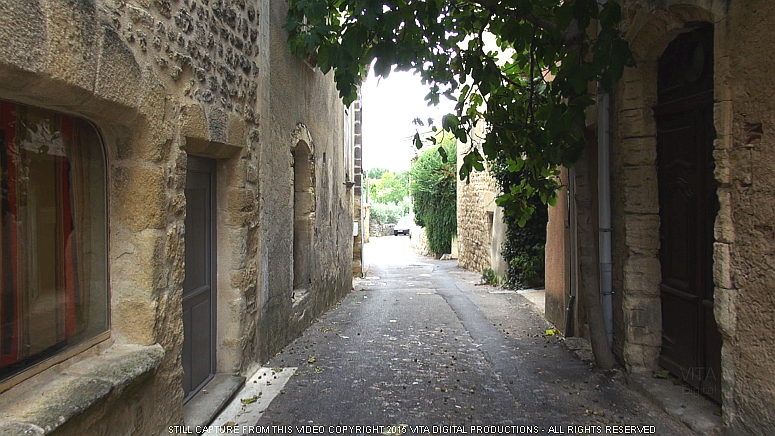 you find yourself walking in this beautiful narrow French street. 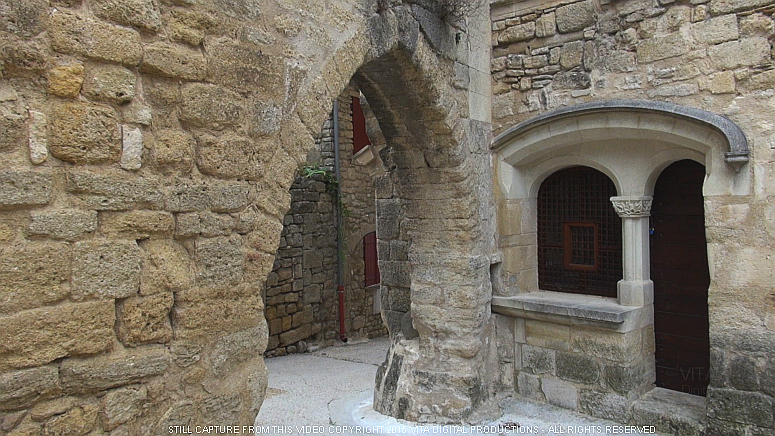 that have been homes to countless families through the centuries. 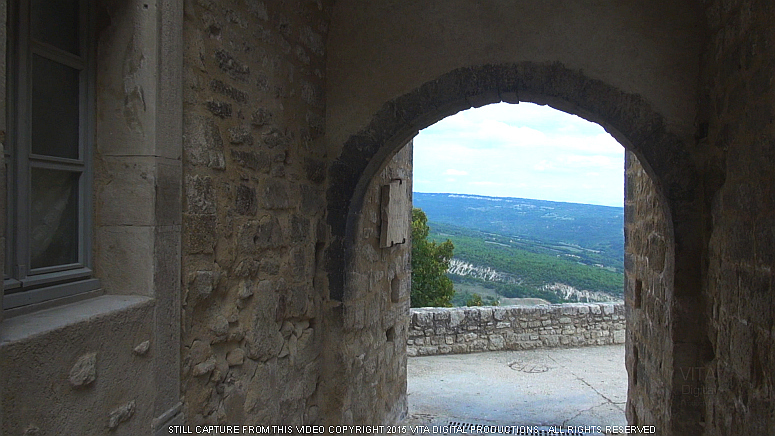 you pause to take in another stunning view of the landscape that is Provence. 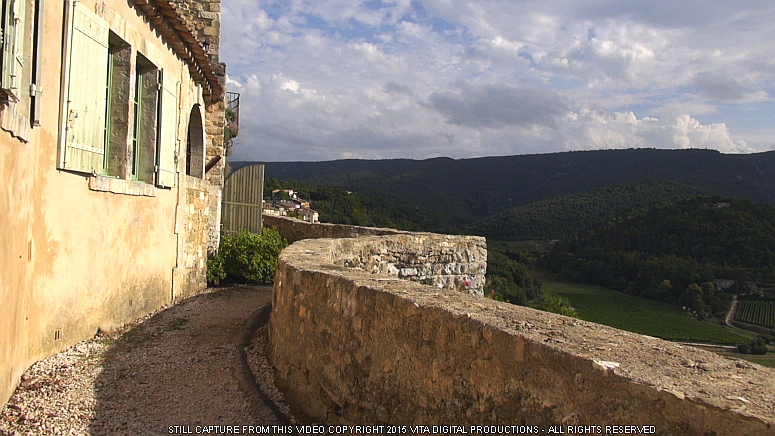 like this one, just waiting to be captured on canvas. 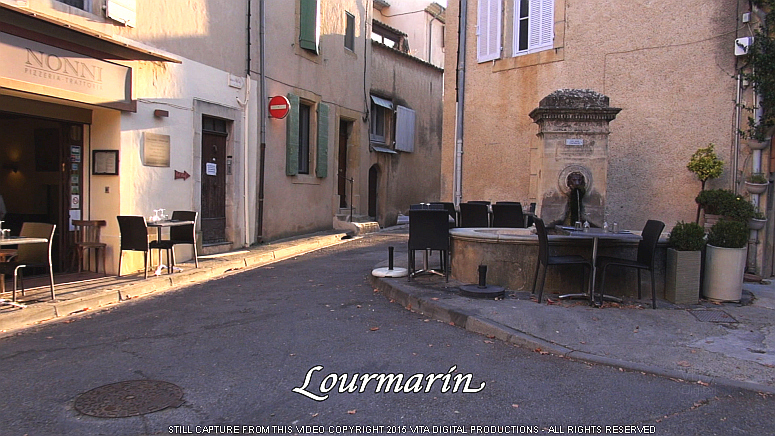 Next, you enter the village of Lourmarin, designated "L'un Des Plus Beaux Villages de France" by the French. 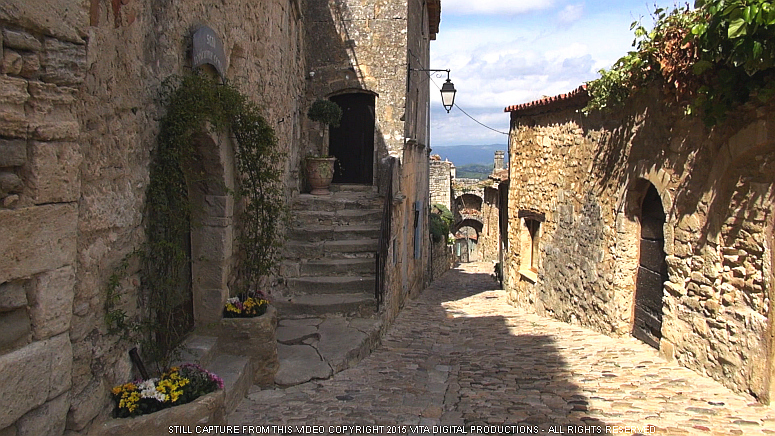 And you can see why the village was so honored. 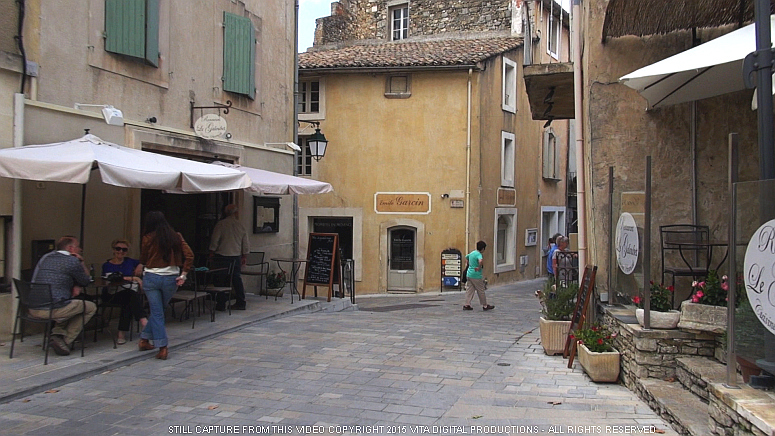 and narrow streets with shops and cafes just waiting to be explored. 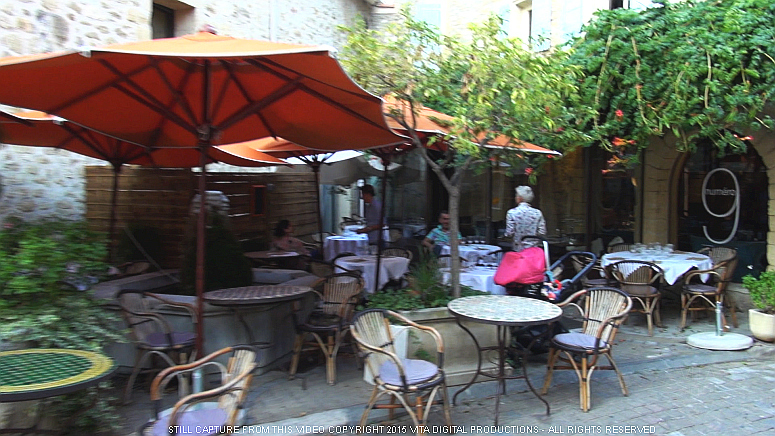 outdoor cafe with a glass of wine, lemonade, or favorite aperitif. 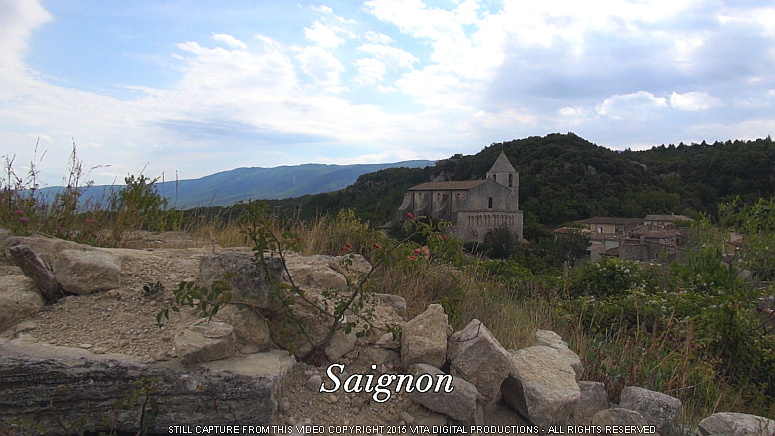 the 12th century Saint Mary of Saignon, has been a stopping point for religious pilgrims since the Middle Ages. 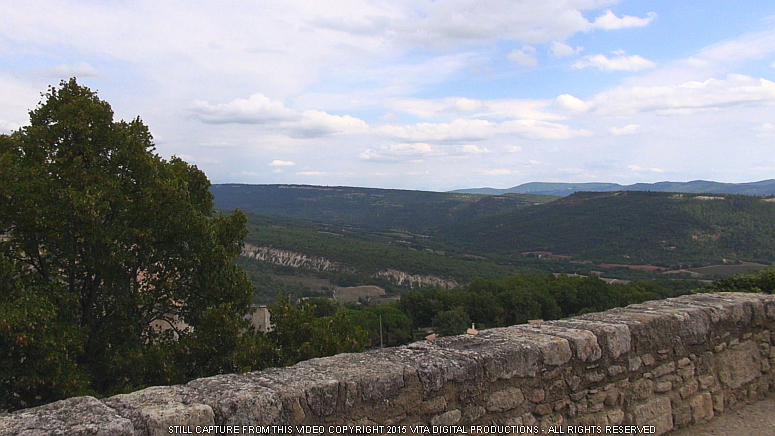 you pause to admire the magnificent view. 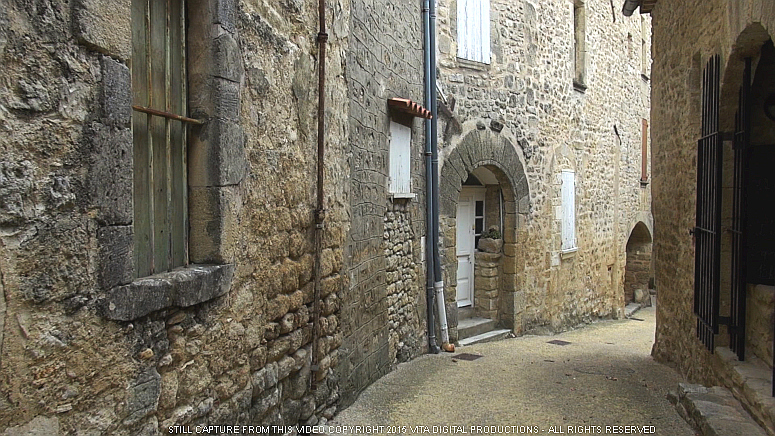 to the outside of the 12th century village church where Marriage Banns are still posted in the green box to the left. 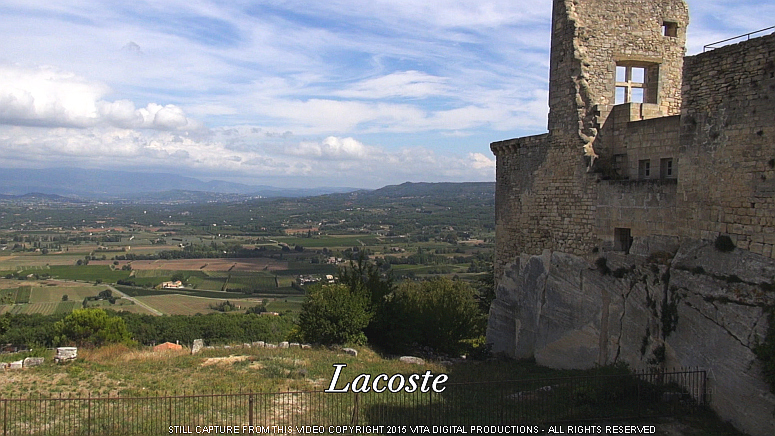 Then on to the village of Lacoste, a village where time appears to be standing still. 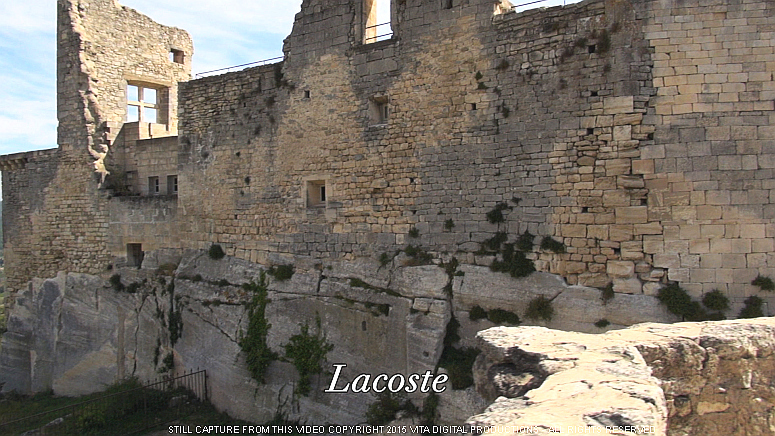 Château de Lacoste. 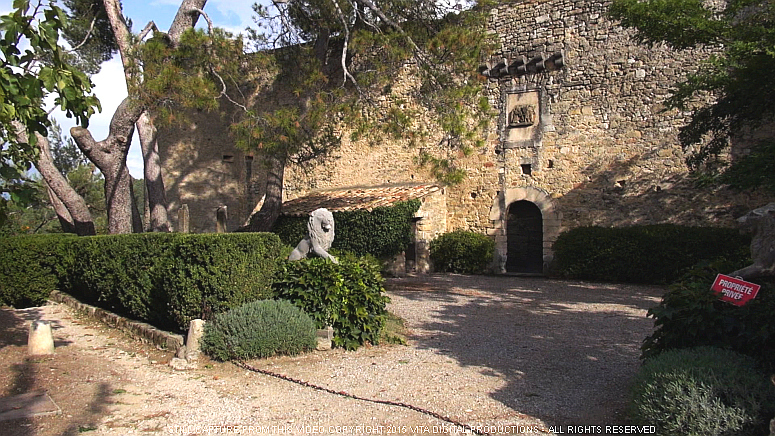 Today, fashion designer Pierre Cardin has purchased the Château and built a new residence within its walls. 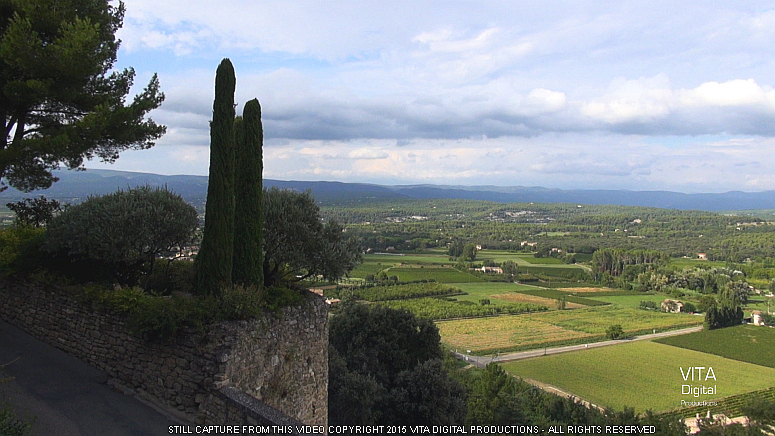 and once again, pause for a view of the valley and the incredible Provencal landscape. 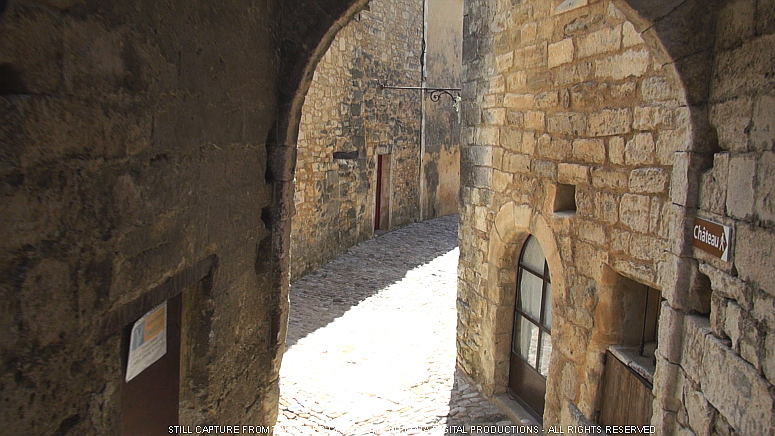 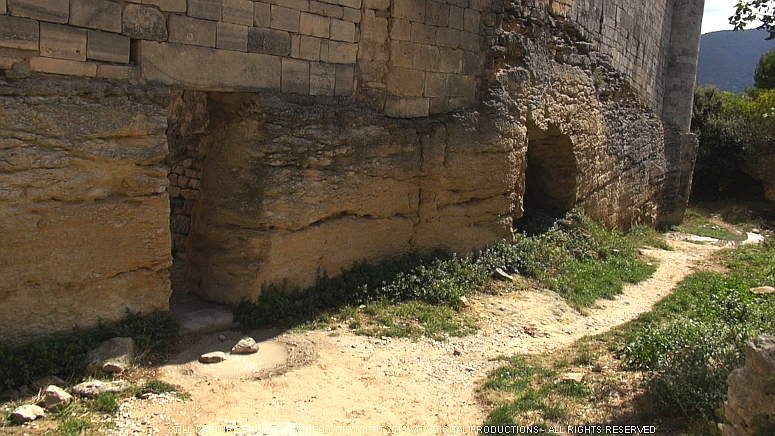 Then you continue down through the nearly empty stone streets of Lacoste. 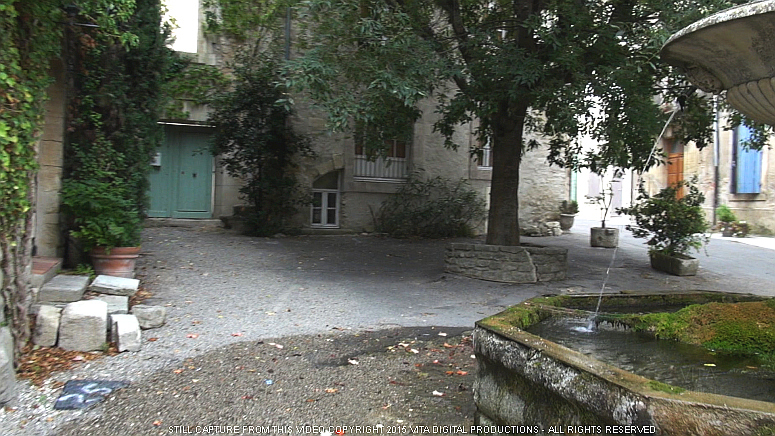 studying fine arts, writing, architecture, design, fashion, film, photography, sculpture, and theater. 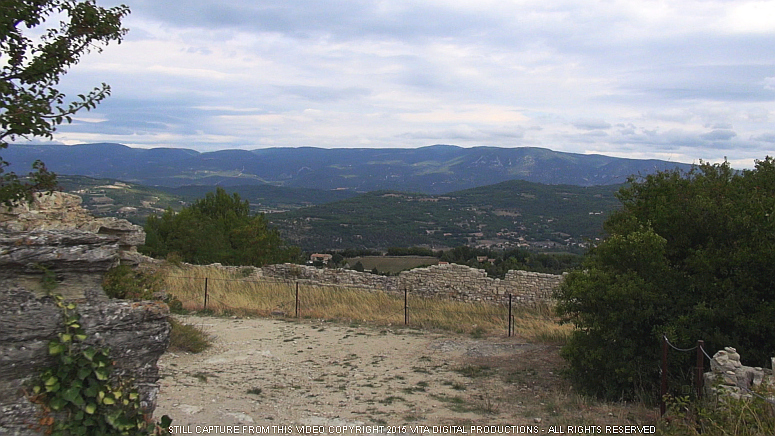 and trenches and barbed wire still can be found in the forested area in the valley. 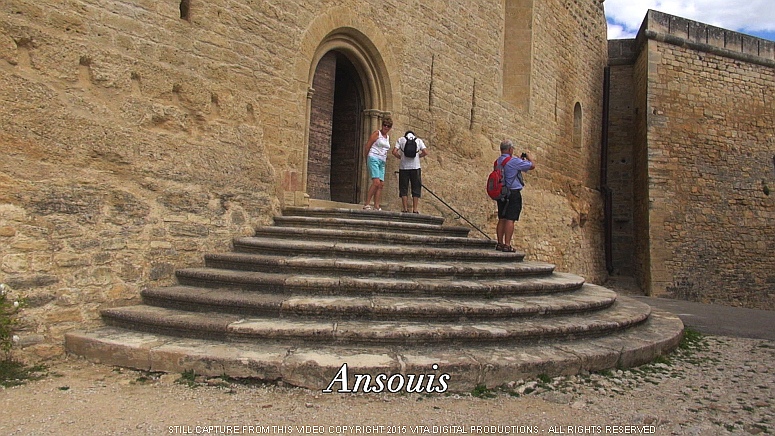 Next you visit Ansouis, also designated "L'un Des Plus Beaux Villages de France" by the French. 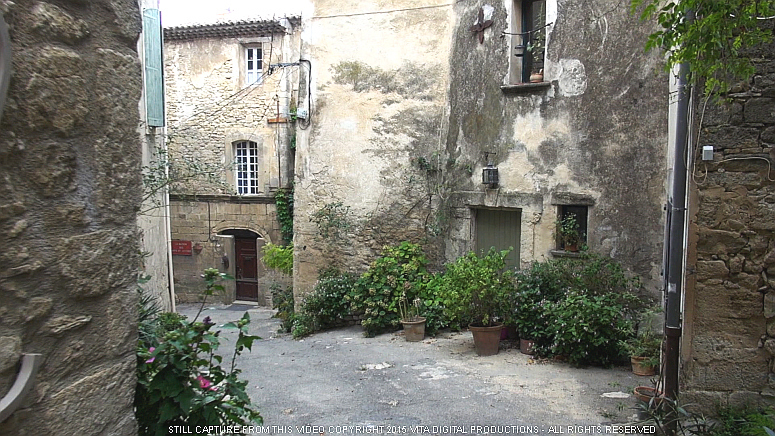 Ansouis, often described as a 'mini version' of nearby Gordes, is a quaint medieval village dating to the 10th century. 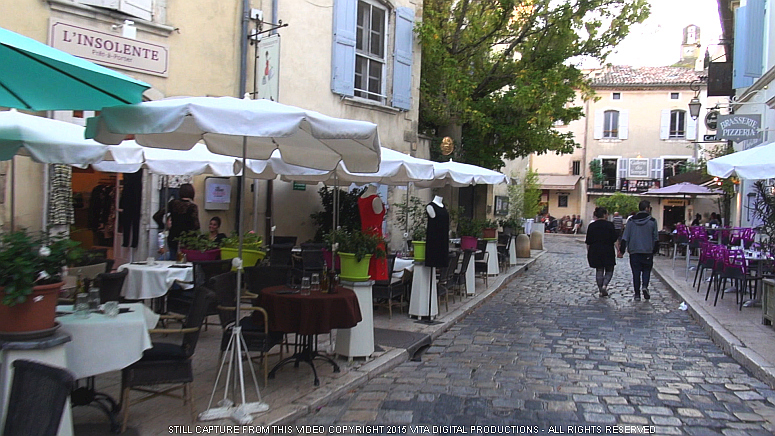 while other sections of Ansouis were compeletely empty. 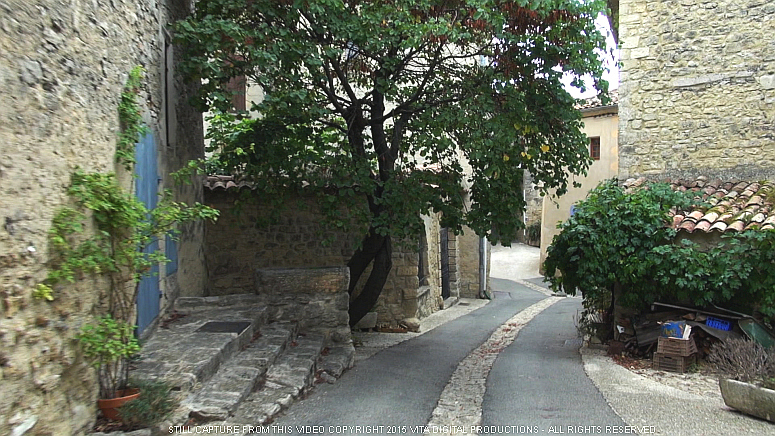 designated "L'un Des Plus Beaux Villages de France." 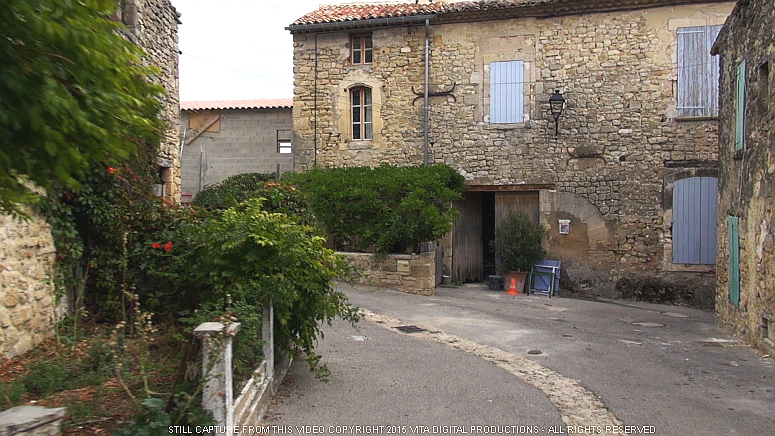 who related his experiences as a British expatriate who settled in this village. 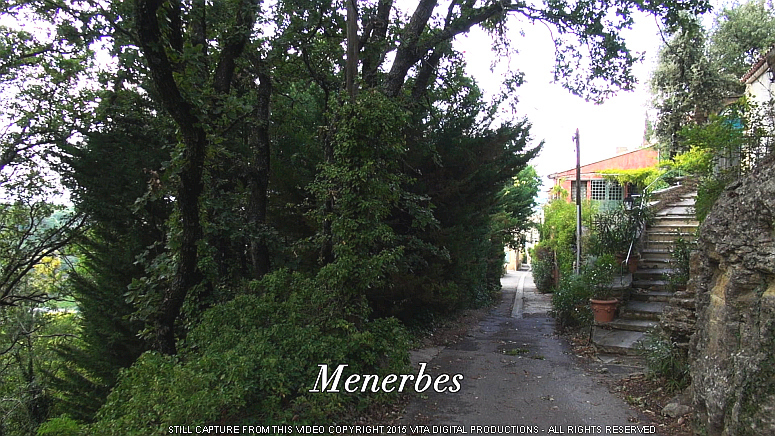 before continuing on through Menerbes. 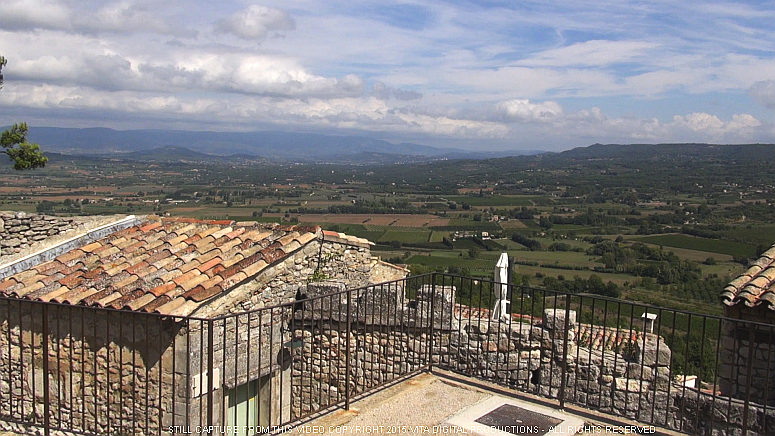 Your 60 minute walk continues through the village and ends with this view of the Provence countryside. 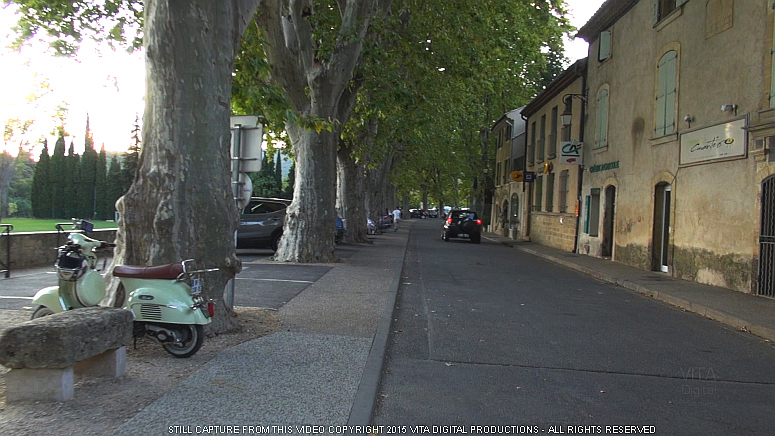 in the streets while we filmed this video. 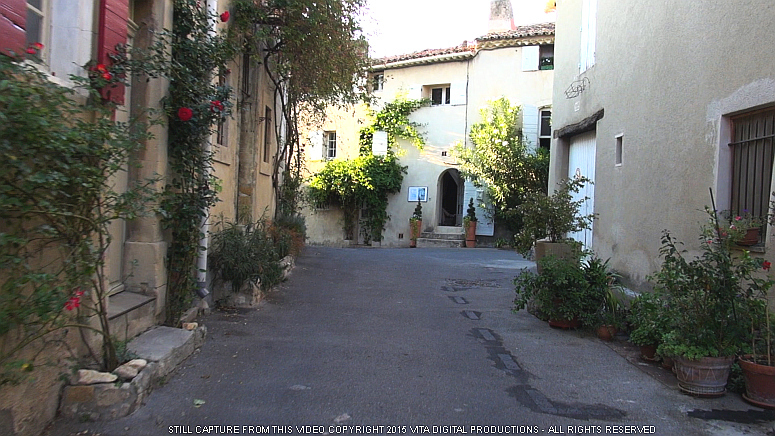 by the Natural Sounds in Dolby Stereo as they were recorded in the six villages of Provence. 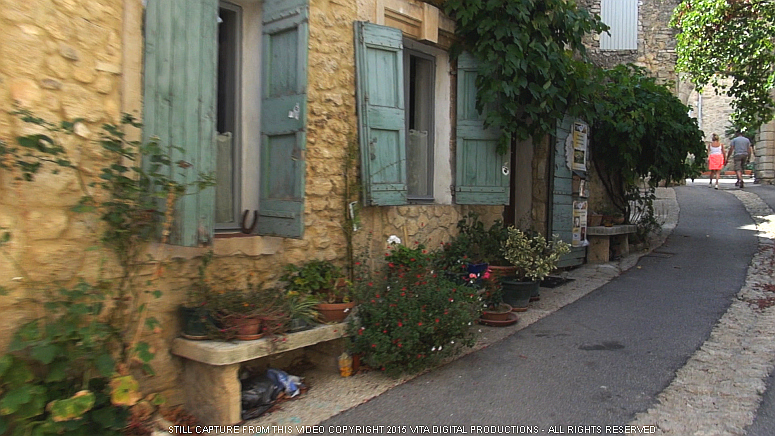 All of the above photos are actual still frames from this video/DVD.